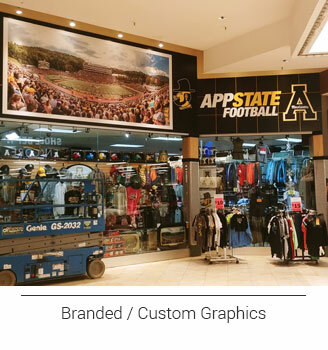 From the floor to the ceiling and the interior to the exterior of your store, you have many opportunities to attract, up-sell and retain your customers with the power of large format printed graphics and wall murals. Our expert advisers can help you make the most of each of these opportunities to increase your sales, build your brand, and make a lasting impression. 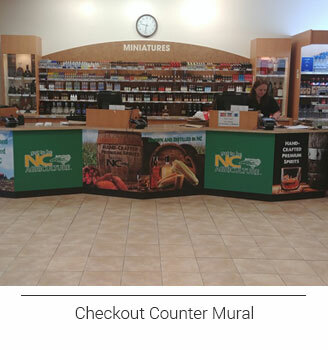 Magic Murals offers retailers and various storefront businesses custom visual solutions including wall murals, floor graphics, window advertising, wall posters and other retail and commercial graphic options. We'll work directly with your artists and designers or we can serve as your design team, creating and incorporating logos, trademarks and other custom artwork into revenue generating retail graphics. 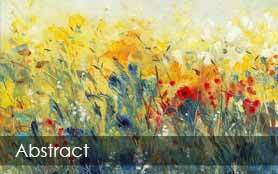 Complete the Retailers Request Form below for our exclusive offers. 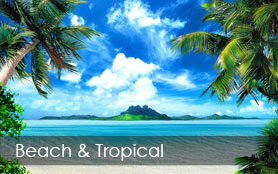 Please include your mailing address to receive our Swatch Kit ONE, mailed via U.S. Postal Service. When it comes to brick and mortar stores, if you don’t get them in the door, you’re not likely to make the sale. 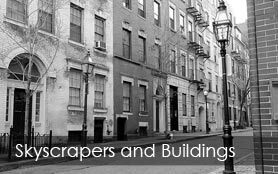 For external walls, made of brick, masonry, concrete block or pretty much any other material, we have several material options which are compatible for outdoor applications. SuperStik™ is our heat-applied color graphic material that will permanently and seamlessly contour your business name, logos and other marketing messages right into the side of your store. 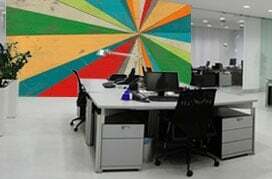 You can go from bold colors and a fully modern, freshly-painted wall mural look to something vintage-looking like the old Coca Cola murals painted on the sides of grocery stores, restaurants and gas stations/convenience stores across America back in the day. If you are looking for a more flexible material that is not as permanent as SuperStik™, we can also provide custom printed building banners of any size. Not all retailers have external walls (particularly those located in malls, shopping centers and dense downtown shopping districts), but chances are excellent that you have some large display windows you can use to stop those pedestrians from walking by and get them heading right into your store. 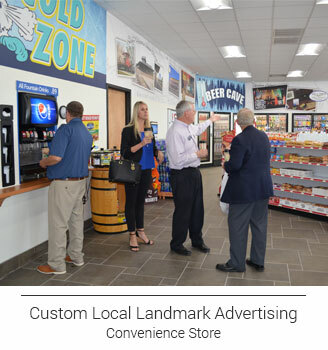 Let Magic Murals help you drive in-store traffic through your front doors. For more permanent signage, our Perforated Window material for exterior glass applications is an excellent solution that presents your full color message to the outside world while allowing light to flow into your store and everyone inside it to see out. Perforated window films can be used to cover an entire window or just a portion of it. Simultaneously, the perforated film helps to minimize excessive heat and harmful UV damage by providing a layer of "tint" while also giving privacy to those inside while beckoning the public to enter. 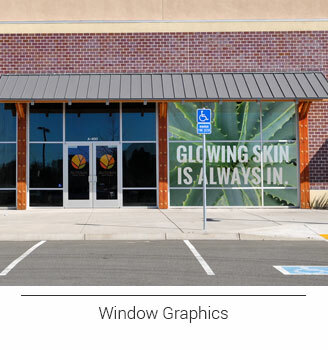 For more temporary signage that’s promoting a sale, new product or service offering, seasonal merchandising, etc., we offer a variety of pressure-sensitive window clings and other printable window films that can turn a passer-by into a customer. All of our window signage solutions are custom crafted to your specifications. Cover the entire window or just a portion of it with poster-sized graphics. Allow various levels of light in with varying levels of transparency including our frosted film option. 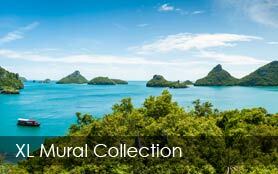 Or go small with contour-cut decals and other isolated graphics that can be cut into all sorts of shapes. 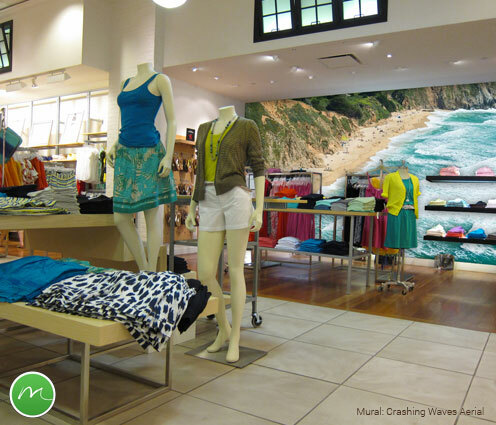 Our self-adhesive wallpaper wall murals provide the perfect solution for all of your in-store signage and retail décor needs. 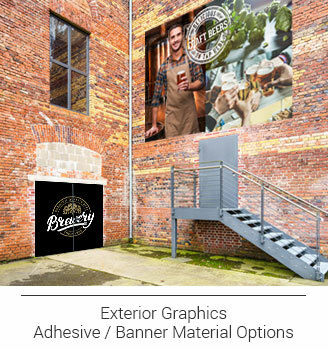 Build your brand with wall graphics and large format photographs that reflect your style, unique selling proposition and other brand identifiers that appeal to your customers. Create POP and POS displays that sell. Many of our self-adhesive materials are removable and reusable. Use our RoughStik™ material to create wayfinding floor graphics that usher your patrons through the store to help them find all of those must-have goods they didn’t even know they needed. For large chains, franchises and other retailers with multiple locations, we can ensure that each location gets the materials they need, when they need it, according to your logistical plan. 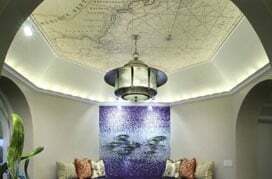 We’ll work with your designers, architects, project managers, store managers and anyone else you wish to make sure there’s all the continuity you require among your locations. Of course, not all selling is done in the store. If you’re a franchisor, manufacturer or distributor, our large format graphics are perfect for your trade show and other exhibit needs. Our self-adhesive wall mural materials are perfect for trade show and convention booths and can often be used to update your current signage and displays, saving you time and money. It’s also eco-friendly to re-use what you can. Please call us today at 877-448-7295 or email us at service@magicmurals.com to discuss your project and how we can assist you in growing your business through the power of stunning retail graphics.